I’m passionate about science, science education, and policy. About a week later, I received an email from Chloe Poston, GSA Policy and Communications Manager, saying I had been selected to go! I was invited to present my NSF-funded research as a poster session at the Coalition for National Science Funding (CNSF) Exhibition on April 26th. Chloe also organized meetings with the offices of my Wisconsin representatives, Sen.Tammy Baldwin (D), Sen. Ron Johnson (R), and Rep. Mark Pocan. April 26th, 2016, was one of the hottest spring days in D.C. I’ve ever experienced. It also just happened to be the day I was meeting with the staff of my Wisconsin representatives. Each office has snacks and decor related to the state. 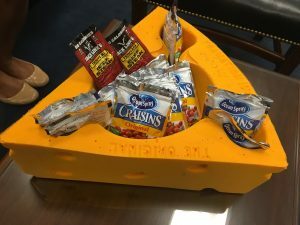 We found beef jerky, raisins and a cheesehead in the waiting area of Sen. Ron Johnson’s office. I met Chloe Poston from the GSA in the morning and she briefed me about what to expect, and reassured me that she would accompany me on my visits. 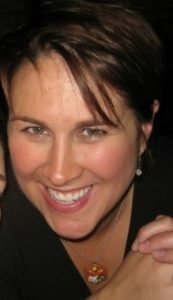 This put me at ease as she knew information I didn’t, and we worked as a team. Chloe was able to converse with them using their lingo (that I was not accustomed to). Chloe had already told me I didn’t need to prepare anything, but she suggested that bringing along a short presentation wouldn’t hurt. Luckily I took her advice. The visuals and movies really helped explain the impacts of my research and why NSF funding is important. After visiting all three offices, I thought we had made the biggest headway with the Republican. That’s not what I expected. The democrats in my district and in Wisconsin are fully supportive of science. They assured us that they are following support for research closely, and thanked us for coming to the Hill to raise awareness about research funding. Although the office was sweltering, my presentation and enthusiasm plus Chloe’s experience and data helped win Rep. Ron Johnson’s office over. We were soon asked who to talk to about increasing NSF funding (which was great!). We mentioned Sen. Tammy Baldwin, who authored The Next Generation Research Act, which would ensure support for researchers and innovators of the future. Chloe assured me that it was a really good sign that he asked so many questions and wrote notes on our conversation. I also couldn’t help but get excited about history and current events. Being a fan of politics, I tried to spot representatives and senators I knew. I saw some very tall men in 10-gallon hats talking with a senator, perhaps from Texas. Others chatting near the elevator asked us where we were from after overhearing our accents. I was looking for Bernie’s YUUGE office, but didn’t get a chance to see it…maybe next time. The Exhibition was just like any other scientific poster session you’ve been to, except there was an awkward feel in the room. I couldn’t put my finger on why, but then realized that all of the scientists presenting, including me, seemed a little uncomfortable appearing to be “dressed up”. As many of you know, the last place scientists want to be is in a suit. This meant it was pretty easy to spot the legislators and staffers, given their ease and experience wearing these pieces of clothing. As legislators and their staffers trickled in, I whipped out my laptop, put some of my movies of C. elegans embryos dividing on a loop, and asked people if they “Wanna hear about how cells divide?” It was a lot of fun to see what policymakers knew about mitosis and to show off what cell division looks like in real time. 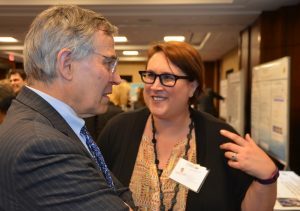 I spoke to other geneticists, mathematicians, physicists, staffers, NSF program officers, and even Rush Holt (rep-NJ), CEO of the Science family of journals at AAAS. I was also approached by a AAAS fellow who said I did the best job at visualizing my science to the general public. In hindsight, I would have even simplified my poster even more. But live and learn. Probably the greatest thing that happened to me was on my way home from D.C. I got to the gate at DCA and saw Russ Feingold! He’s a former WI senator now running for Ron Johnson’s senate seat! Being a huge fan, I bit my lip and acted like I didn’t know who he was (and then texted everyone I knew!). My plan was to say hello after we landed. So I ran and got my bags and waited. Just as I gave up and went to meet my husband outside at the curb, Feingold stepped out of the airport. He must’ve seen me eyeing him (like a huge fan girl) because he said hello. From about twenty feet away, I thanked him for his service. He walked toward me and introduced himself, asked what I do. When I told him I was a professor, he wanted to know about my research and where I went to grad school. While I was chatting, I reached into my backpack to find my business cards and out came probably the dirtiest business card possible. “This is all I have and apologize for the dirt, but would like you to come to visit my lab sometime?” I said. As he walked away, I thought to myself: no one would respond to such a dirty business card. 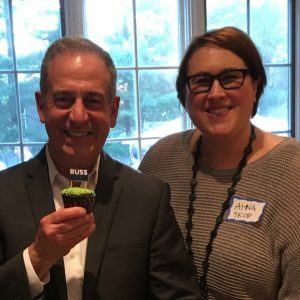 Russ Feingold holding one of the cupcakes I baked. Two days later, I was in my office working on a revision of my manuscript and my office phone rings. “This is Russ Feingold’s secretary. He met you at the airport the other day and would like to invite you to a dinner in his honor at someone’s home next Friday. Can you come?” First, I thought it was a joke (or a dream), but she said she would email me the details. A week later, I had a chance over dinner to talk with Feingold about science and the fate of UW-Madison, something I care so deeply about. I also baked him some cupcakes, which he loved. His office is planning a visit to my lab too. The moral of the story is: you never know when you might meet a politician – so be prepared with clean business cards and a smile! Start early in preparation of your visit. Ask GSA or other scientific associations if someone from their office can accompany you. Prepare to meet office staff that will likely be in their mid-to-late 20s. Yes – young! Remember that you have only 5 minutes to explain your research, so good visuals really do help. Movies are even better if you have them. The best way to start is to ask if they know something basic about the process you study. Like cell division or what DNA is. Then slowly work your way to why is cell division important to understand, etc. If you’re struggling with these explanations, keep working at it. Or better yet, get involved in outreach events on campus or at your institute. Be passionate about your research/teaching and be yourself. The last thing you want them to think about scientists is that we are as dry and exciting as toast. I encourage everyone to get involved, learn about science policy, learn to be a better science educator, support STEM diversity efforts, contact your representatives and senators, post about science on social media, and any other ways you’re comfortable engaging with the public. But simply get engaged! Ahna, your ability to step out of your comfort zone and make take chances is so admirable. You truly are various force to be reckoned with. Great post, Ahna! I hope this will inspire others to follow your lead.